"Leaves of three, let it be; berries white, poisonous sight," is the familiar adage for recognizing and avoiding poison ivy and its relative, poison oak. That's wise advice for a hiker, but as gardeners, we want to remove poison ivy from our gardens - and we want to do it without suffering an allergic reaction. Poison ivy is formally known as Toxicodendron radicans, although was once called Rhus toxicodendron. It is native to the eastern United States. Poison oak, or Toxicodendron diversilobum, is native to the western areas of North America. Both plants have a variety of forms, so they can be difficult to recognize. Poison ivy leaves can be toothed or smooth, but they always appear in clusters of three leaflets. Poison ivy typically grows as a vine, hence its common name. It can also grow as a ground cover or shrub. It is often confused with Virginia creeper (Parthenocissus quinquefolia), which has similarly-shaped leaves that appear in clusters of five. Poison ivy leaves are likely to be pink or red in the spring. They often turn brilliant red in the fall, but may also be yellow or brown. Fallen leaves are usually brown. Female plants produce small white berries that are an attractive food to birds. 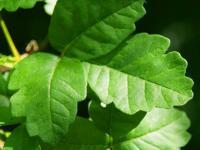 Poison oak has leaves that look very similar to oak leaves, but occur in clusters of three. It usually grows as a deciduous shrub, but can also appear as a vine. 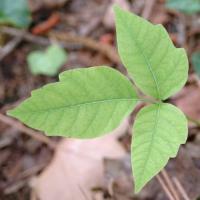 We often assume poison ivy will only be present in the country, but that is incorrect. Birds carry the seeds great distances, and the plant thrives in disturbed soil. It is just as likely to be found hiding in a city hedge or on an empty lot as deep in the forest. Research conducted at Duke University indicates that poison ivy grows more vigorously in the presence of carbon dioxide, so it is likely to flourish in urban air pollution. Freshly-cut stems, roots, leaves, and flowers of poison ivy display a sticky, resinous sap that oxidizes into a shiny black lacquer. 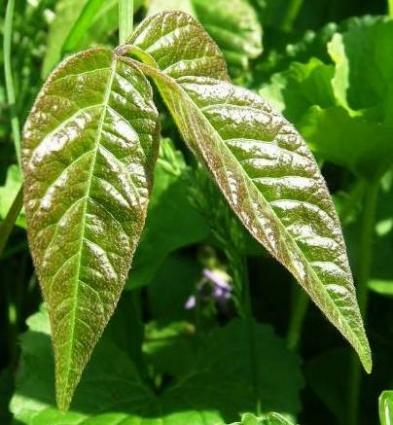 Urushiol is the substance found in poison ivy sap that causes allergic contact dermatitis in humans. It is found only in the resin canals of the plant, so it is often possible to brush against poison ivy without harm. Urushiol is on plant surfaces only when the leaves or stems are bruised or broken. The resinous qualities of poison ivy sap make it difficult to remove. Water alone will not remove it. Urushiol is often carried on garden tools, contaminated clothing, and the fur of pets. Urushiol remains active when the plant is dormant and when it is dead. Allergic reactions to 100-year-old museum specimens are on record. It can be carried in ash and dust particles and even in the smoke from burning poison ivy. Some people claim to be immune to poison ivy, but that is extremely rare. Fifty to seventy per cent of the population are allergic, according to the Food and Drug Administration, and most of the rest will become allergic following exposure. The American Academy of Dermatology estimates that there are up to 50 million cases of allergic reactions to poison ivy each year in the United States alone. Sensitivity does vary, with some individuals showing only minor symptoms. Others are so sensitive that exposure to a molecular trace of urushiol - about two micrograms or less than one millionth of an ounce - on the skin will cause a reaction. Itching, redness, and blisters are the typical reaction to poison ivy. It occurs when urushiol has been absorbed through the skin and bonded with proteins to create new compounds, which the immune system treats as an invading disease. These symptoms can occur as long as a week after contact. An allergic reaction can be serious. About ten per cent of lost work time in the U.S. Forest Service is due to poison oak and poison ivy. Firefighters who breathe the smoke from burning poison ivy are especially at risk. Minimize your exposure. If you are gardening in an area where poison ivy is present, wear protective clothing and gloves. You may also choose to use Ivy Block®, a product developed for the U.S. Forest Service. It forms a barrier that both prevents urushiol from touching the skin and chemically binds it to make it inactive. If you've touched poison ivy, clean the spot immediately. Urushiol will penetrate the skin in ten to fifteen minutes, and once it has done that, washing will be useless. Don't use plain water or water plus an oil-based soap, because urushiol is a hydrophobic oil. Rinsing with plain water is likely to spread the oil further. An alkali soap like naphtha soap, or a dishwashing soap with a 'degreaser', will get better results. A product originally developed to remove radioactive fallout dust from the skin, now sold as Tecnu Oak-n-Ivy® Cleanser, does a good job of removing resin and urushiol from the skin. Clean your gardening clothes and tools before using them again. Remember to use an alkali soap, not just water. Poison ivy and poison oak are resistant to many herbicides. Glyphosate-based Roundup® and Rodeo® from Monsanto will eventually kill them, but repeated applications are usually needed. Remember that the dead vine still contains urushiol and must be disposed of carefully. Young plants can be pulled out. It's easiest to use a plastic bag over your hand. When you've pulled up the plant, reverse the bag to cover the plant completely, tie it shut, and put it in the garbage. Larger vines and plants can be cut off at ground level. They should be sealed in a plastic bag. Dig out the taproot and place it in a sealed garbage bag before sending it to the landfill. Do not pull down a vine without extensive protection, particularly for the hands, face, and eyes. Do not burn the vine.